Too Hard On The Knicks?? There are some of my readers who think that I am, perhaps, a bit too hard on the Knicks. Well, with last night's loss to the Warriors the Knicks now have the worst start in franchise history. That is right, never in the history of the Knicks have they started out 1 and 9. Oh, and did I tell you that the Jazz will get the Knicks 2010 first round draft pick? Think about that, Isiah and company gave up the Knicks 2010 first round draft pick, among other things, for a guy who isn't even playing in the NBA anymore; the self-proclaimed "best point guard in the game," Mr. Starbury. A small consolation is that Isiah Thomas is already getting booed at FIU and there were chants of "Fire Isiah!" after they lost their opener to Monmouth 99 to 70. "I'm telling you what it is: I know I'm the best point guard in the NBA. I don't need anybody else to tell me that." "Don't get me wrong -- I love Jason Kidd. He's a great point guard," Marbury said. "(But) how am I comparing myself to him when I think I'm the best point guard to play basketball? That doesn't make any sense. I mean, how can I sit here and compare myself to somebody if I already think I'm the best?" Oh yeah, he made those comments in January, 2005 - that year the Knicks went 33 and 49. Still, that was better than the next year when they were an incredible 23 and 59. Imagine that, and with the best point guard in the game on the team. Oh, yeah, and after improving to a merely miserable 33 - 49 season we managed to have the same 23 and 59 record the next season. And all with the same self-proclaimed best point guard to play basketball. Did I tell you that those two 23 - 59 seasons were the worst two seasons in Knick's history? At least up until this year. Okay, I am over it now, really, I am. According to Rex Ryan, head coach of the Jets, the fans need to wake up and cheer louder to help their team win. That's right, we need to be prideful because this the fan's football team. The fact that they are 1 and 4 over their last 5 games should have nothing to do with a certain lack of enthusiasm. Personal seating licenses and the promise of higher ticket prices should have nothing to do with fan loyalty. Anyway, I decided to submit a Letter to the Editor of the New York Daily News which published several articles and a back page headline about Ryan's ravings. I thought I would share it with you. Jets coach Ryan says fans must wake up in order to save the Jets season? Give me a break. I have been going to Jets games and cheering them on since back when they played at Shea Stadium. We had a regular tailgate group that went to all the games. Then the Jets limited the parking so our group could no longer tailgate together. Then they wanted to hit me with a $15,000 a seat PSL fee and said they would raise my ticket prices from $80 a game to $140 a game. Guess what, I no longer go to Jets games and am no longer a die-hard fan. Funny how Jets management wants you to cheer the team when what you really want to do is scream in frustration, not only at their poor play, but also at their poor management decisions and total disregard for their fans. This is one fan who did wake up. And don't even get me started on the Knicks. I used to have season tickets for them as well. Don't get me wrong, I don't abandon a team just because they have a bad year or two. But when teams seem to have a total disregard for their fans ($15,000 for the right to buy tickets) or their management seems to be totally imcompetent (the Jazz will get the Knicks first round draft pick this year, thank you Isiah, we really needed Starbury) then I will walk away. Ah, it is a chilly, overcast, damp day so a good rant kind of heats up the blood. If the letter actually gets published, unlikely, I will be sure to let you know. Monday, it being a nice sunny and fairly warm day, the Mysterious Chinese Woman and I decided to do somthing a little bit different. 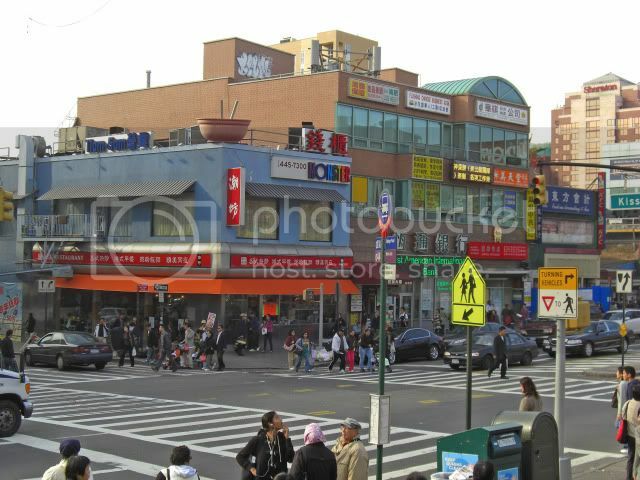 We went to the Chinatown in Queens. Usually we go to the one in Manhattan that we can walk to, if we are feeling ambitious. To get to the one in Queens is a bit more of a trip involving a couple of subways. First a train to Grand Central, then a switch to the train out to Flushing, Queens. We were a bit disappointed, this being the first time either of us had been there. It is, supposedly, bigger than the one in Manhattan, but it is not nearly as picturesque. Much more of a commercial looking area with a heavy Asian influence. I guess that is because it is newer and doesn't have all of the neat little nooks and crannies like the older one in Manhattan. Anyway, we didn't stay too long, just took a little walk around and stopped at kind of a neat place for lunch. There is nothing very fancy about Chao Zhou Restaurant, kind of a cafeteria look to it. But it was doing a nice little business and, always a plus, almost everyone in there was Chinese. It looked like a place where a lot of the people who worked in the area stopped for lunch. The prices were very reasonable, a lot of $5 lunch specials, things like bitter melon over rice with your choice of beef, chicken, shrimp or sliced pork and garlic leaf with preserved meat over rice. Things that the Mysterious Chinese Woman said were typical peasant food. They also had the usual stuff like sweet and sour pork and quite a few fried noodle and rice noodle dishes. 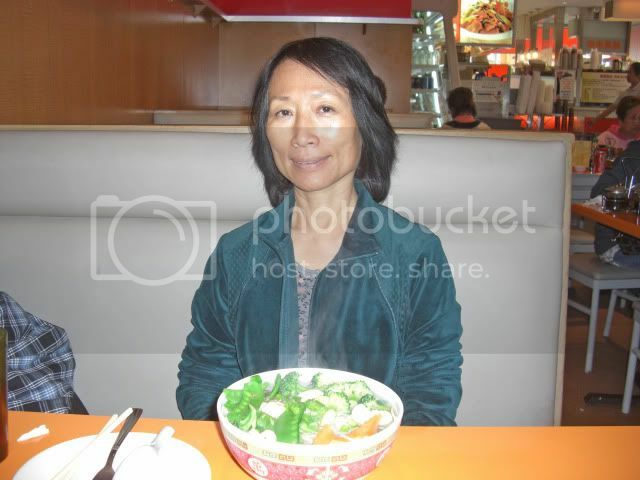 The Mysterious Chinese Woman had a healthy looking bowl of noodles with vegetables of some kind. Needless to say, my attention was caught by a less healthy choice. I mean, How can you pass up a plate of pork parts that includes ears, snout, tongue, and intestines. 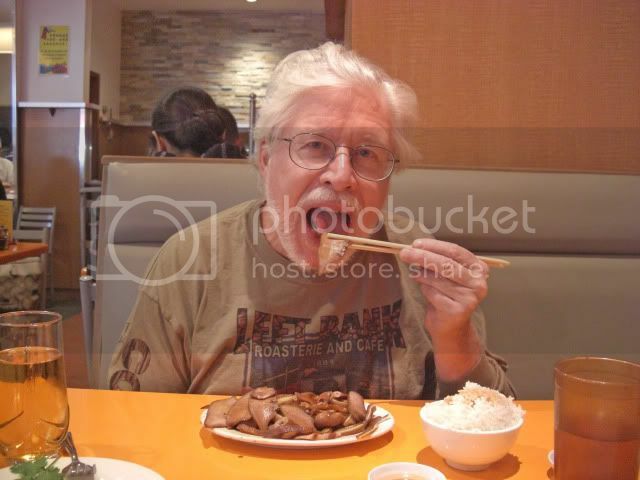 You know you ordered good when the waitress asks you if you are sure and then gives a glance at the Mysterious Chinese Woman to see if it really is okay. I was thinking maybe I would get kind of a pork parts stew, but this was more like cold cuts. In fact I often get the ears like they serve here when I go to an Asian market in New Jersey. The ears from the market are prepared with a chili paste, though, so they are much hotter. They make for a nice chewy snack and go good with beer. The pork parts were served with several slices of pickled carrots and some kind of a large white vegetable, a chinese radish, I think, also sliced and pickled. They were quite good and really went well with the pork parts. They did cover up the dish a bit, so here is a bit of better shot. If you are a bit adventurous I would certainly recommend a visit to Chao Zhou. 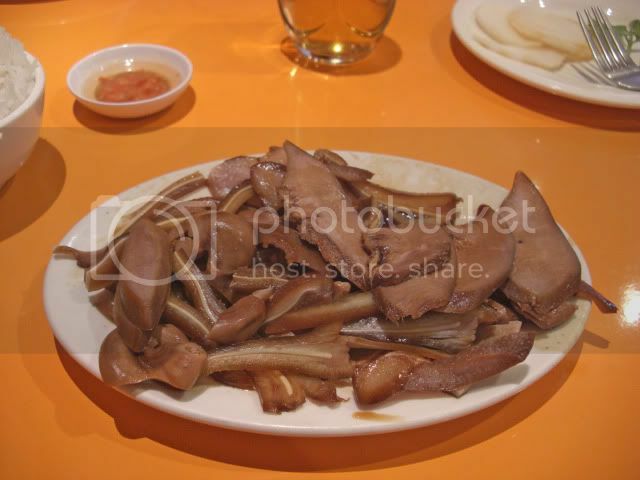 You could also order those pork parts sauteed with ginger and scallions. Or you could try the sauteed pig heart with peppers in a black bean sauce or, perhaps, the pig intestine with preserved vegetables in a noodle soup. And how could you not want to stop in for one of their breakfast specials, pork and jelly fish congee, only $3.95. 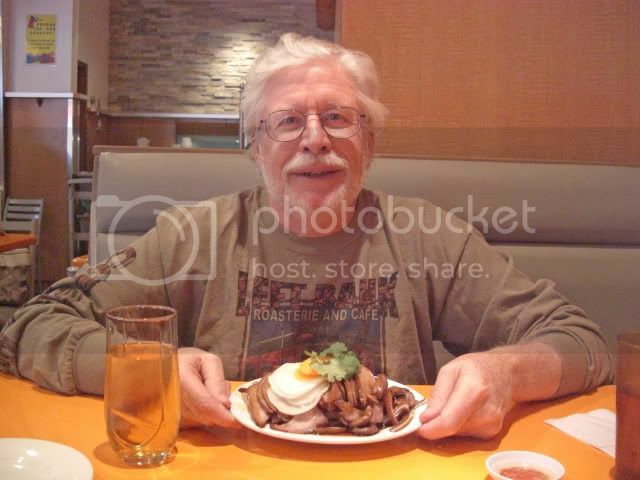 Actually, except for the congee, kind of a rice porridge, I like most of this stuff. If this place wasn't so far away I would go back fairly often. I will have to check for a place in Manhattan that serves similar fare. I am sure there are a few. Every once in awhile, because Bar Man is, after all, considered quite the trend setter, I will receive word, or even a free sample, of a product so that I can pass along my comments about it. Needless to say, people hang on my words like they would hang on to, oh, a hot poker. 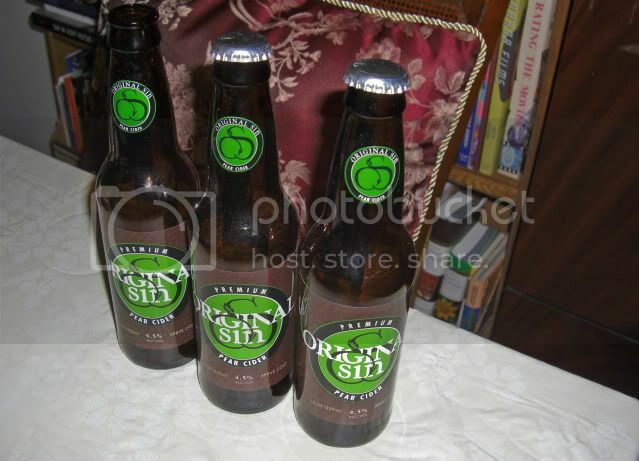 Anyway, the other day I received three bottles of Original Sin Pear Cider from someone representing Original Sin asking me my opinion. 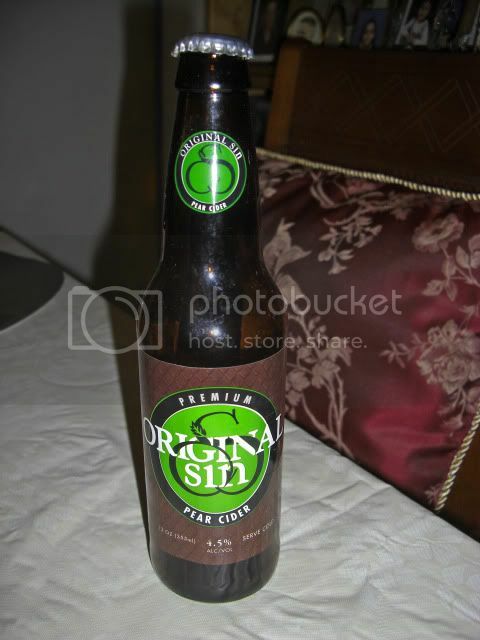 I have had the Original Sin Apple Cider before, and quite like it. The Pear Cider is something new that they are introducing. I was going to share these with my brother-in-law, Jim, but he couldn't make it over. I had no alternative but to drink them all myself, before they went bad. I should have at least saved one for the Mysterious Chinese Woman. Bad Bar Man. But, I drank one, then another, and then I said "The hell with it," and drank the last one. The Pear Cider was quite good. Not overly sweet and without an over-powering pear flavor. I have had pear ciders that were just too cloying to be enjoyed. I found the Original Sin to be quite refreshing. It would be great on a picnic on a warm spring day or at a tailgate party on a warm fall afternoon. Or out fishing on a hot summer day. Hell, it would be okay in an ice-house during the middle of winter, although I would probably prefer peppermint schnapps in the ice-house. Now, I can't see myself Original Sin Pear Cider on a regular basis, and I sure wouldn't belly up to a bar and order one. Although I have a friend of mine, a bartender, who drinks nothing but hard apple cider. His local watering hole always keeps it on draft, mostly for him. But, I digress. Anyway, I could see myself buying a six-pack of this every once in awhile. And I bet it would be good mixed with a sparkling wine. At only 4.5% alcohol it could stand to have a bit more of a bite, though. I suspect the primary market for this will be women. Today is Sunday and I have decided to devote Sundays to my posting about, well, about things that bug me, perplex me, or otherwise interest me. First off, for weeks there has been this controversy about offering Swine Flu vaccine to prisoners, both domestic and at military prisons such as Guantanamo Bay, while ordinary United States citizens cannot get their vaccine. A lot of baloney, if you ask me. Clinics in New York were prepared to vaccinate up to 4,500 people per day at each of seven different clinics. That would be a total of 31,500 people who could have been vaccinated. A total of 1,700 people showed up. Just who are these people who want to be vaccinated but cannot be due to a shortage caused by vaccinating prisoners? Oh, by the way, no prisoners have actually been vaccinated yet. A weeks worth of "news" coverage on a total non-issue, if you ask me. Here is something else I found interesting and may explain why there are so many illegal and non-union workers in the building trades. Federal law requires that workers on stimulus-funded projects receive so-called prevailing wages, roughly equivalent to union pay. In New York that would be about $50 an hour for someone doing interior demolition. Now, and maybe I am out of touch, it seems as though $50 an hour is a tad high, and certainly explains why someone would be motivated to seek out cheaper labor. Oh, they passed a health bill in the House last night. That is all well and good, I guess. The problem is that I turn 65 on December 4th and this bill seems to affect a lot of the Medicare and Drug supplement plans I have also applied for. Not that anyone could possible understand the bill, but it seems to cut Medicare Advantage programs and eliminates the donut hole in Medicare prescription drug coverage. Seeing as how I have applied for a Medicare Advantage Plan and a Medicare Prescription Drug Plan, what should I do now. It isn't like you can wait and see how it all shakes out. You have a limited time each year within which to make your decisions about these things. By the way, Medicare Advantage Plans are reasonable, but not cheap. I pay a bit over $100 month for Medicare Coverage and about another $300 a month for my Medicare Advantage Plan. Not complaining, but I do wonder how this new health bill, however it turns out, will affect all of this. And the price of a Nathan's Hot Dog at Coney Island has now gone up to $3.15. One of the problems? Higher feed costs have driven up the price of beef. Let's hear it for ethanol. Food for fuel, what a concept. This is also affecting, among other things, the price of tequila as more and more agave fields are being converted to growing corn due to higher corn prices. The New York Daily News sportswriter Frank Isola said in today's paper "The Knicks shattered the NBA record last night for the fastest team to hit rock bottom." And here I thought they had done that a couple of years ago. But only 234 more days until LeBron becomes a free agent. Finally, don't you just love the commercial with the woman with the small children complaining about how the tax on beverages such as fruit drinks (not fruit juice) and sodas will break the family budget. I don't know about you, but I just want to shake that lady and say "Just give the kids a glass of water when they are thirsty. Water from the tap. It is free. It is better for them." Well, there you go. My weekly rant. I feel much better now. I am sure that will change though, especially when I start getting hate mail from union members and mothers with fat kids.